“Litany of Failures” is an apt title for a ceramics exhibit when you consider the risk-taking involved not only in building clay sculptures, but also in trusting them to the fires of the kiln. The occasional deformed and shattered pieces are inevitable. Cheryl Ann Thomas is philosophical about the risks, seeing “failure” as a relative term if, in the end, her abstract ceramic pieces can serve as metaphors for life’s uncertainties. 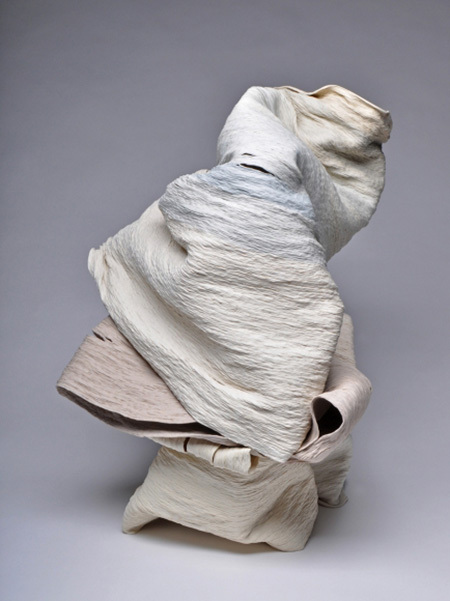 With that in mind, Thomas’ practice centers on coil construction using ultra-thin segments of porcelain clay from which she fashions columns and other shapes. During firing, if the shapes slump or collapse from being too thin or too tall, Thomas is content with having learned something from the experimentation. The pieces might stay as is, or she might enfold them into other “failed” pieces and return them to the kiln. In either case, the results are pleasingly multifaceted and have the ability to engage viewers in a number of ways.